All colours, shapes and sizes! Stickers will never stop being fun. This page is about the kind of stickers you can stick on a friends back. Many of our services use self-adhesive vinyl to transform Windows, Walls and Vehicles but there is a timeless joy to holding a well designed sticker in your hand. 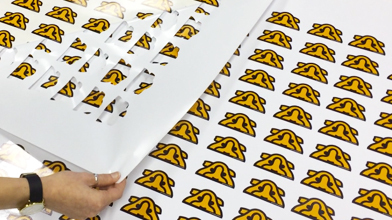 We provide you with a sheet covered in perfectly cut to shape stickers. You can either peel the stickers off individually or you can chop the sheet up your self. 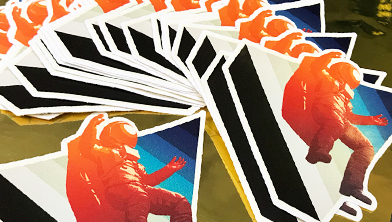 We provide you with a stack of individually cut to shape stickers. These can be distributed one by one ready to be peeled and stuck when required. These are more expensive but great for gifts and merchandise. Use the price calculator below to generate a quote and then simply upload your design. We will confirm your order has been received and payment in on collection or over the phone. You can submit most file types for sticker printing. Some shapes can be too complex to cut but we will inform you and suggest solutions when you submit your artwork.